Robert A. Pape. Morir para ganar: las estrategias del terrorismo suicida. Barcelona: Paidós, 2006, 348 pages. Translated by Marta Pino Moreno. ISBN: 978-8449318979. 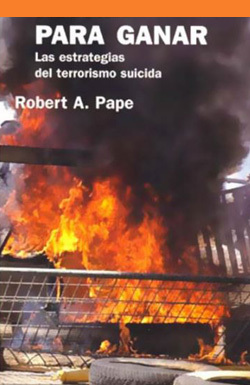 Spanish translation of the original title: Robert A. Pape. Dying to Win: The Strategic Logic of Suicide Terrorism. Random House, 2006. Published in Spanish by Paidós.